I've been excited about this fall theme for a bit now so it was nice to finally get it all planned and finalized. This is the table set up before any food was put on it. I got the tablecloth from Joann's for 60% off or something crazy like that. Great deal! I don't have a picture of the drink for some reason but here's the link. 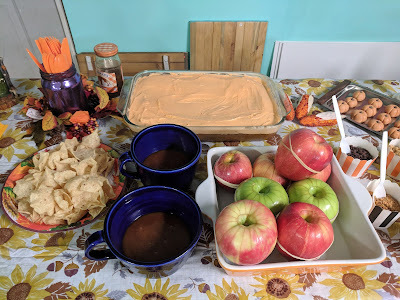 We did the drink in half, the pumpkin spice floated around on the top even after stirring for a long time so we scooped that out with a spoon. Overall I think it was good, a sweet drink and one you have to stir often so the ingredients don't settle to the bottom. 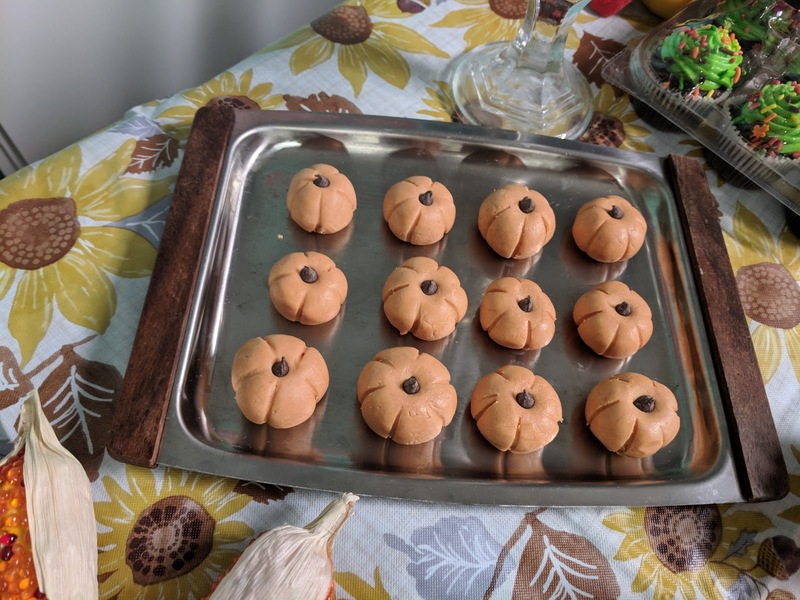 Heather brought these adorable pumpkins! 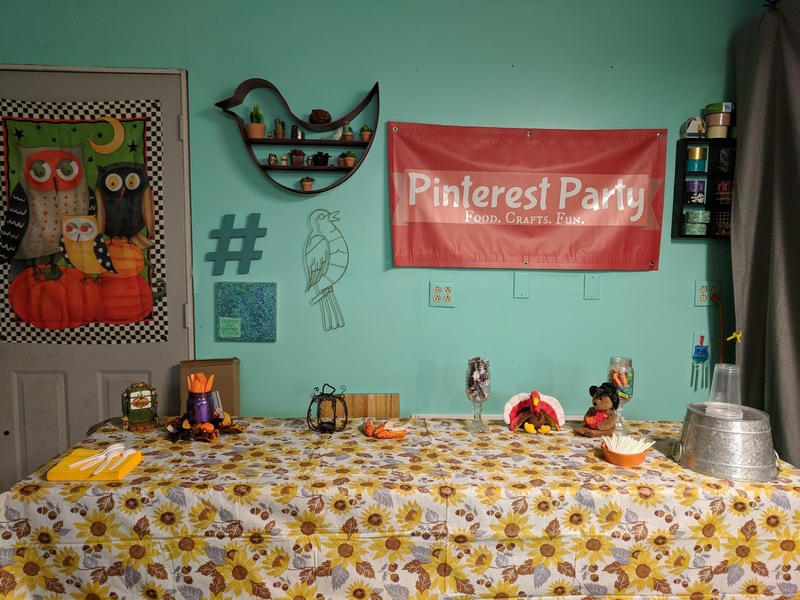 Super fitting for the fall themed party. They are no bake peanut butter pumpkin bites. Ahh. I thought they were really tasty too. Thanksgiving Punch - we cut this recipe in half. It was very sweet but good. You have to constantly keep it stirred up though because the additions to the apple cider tend to sink to the bottom. 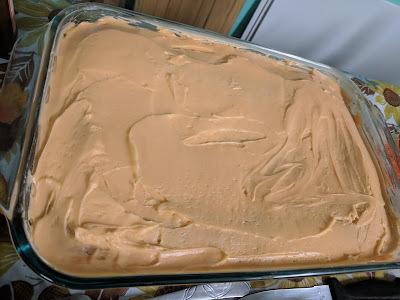 These Pumpkin Frosted Bars were soo good. Homemade frosting...you'll want more than one piece for sure! Caramel apple bar! I soo love doing this kind of thing, maybe because I enjoy being able to customize something (waffles, potatoes, apples!) with various toppings? Inspiration here. 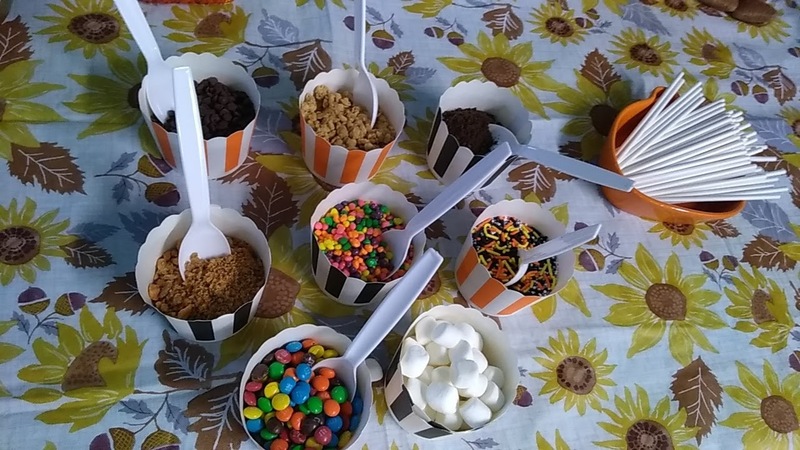 We came up with mini M&M's, marshmallows, Nerds, crushed Oreos, crushed Butterfingers, mini chocolate chips and a combination of sprinkles that people could choose to top their caramel apple slices with. Homemade caramel recipe here. It took Tony a few times to get it right (without burning it) but finally managed on the last try. Phew! 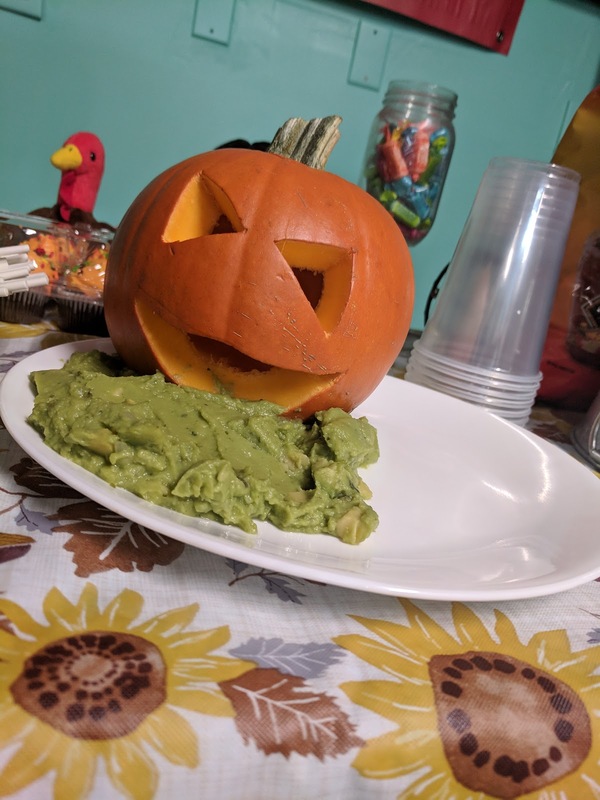 Amy brought this cute little carved pumpkin vomiting guacamole. Lol! I saw this on Pinterest and thought it was the funniest thing. The guac slid out of the mouth a little bit on the drive over but you get the idea. So fun! 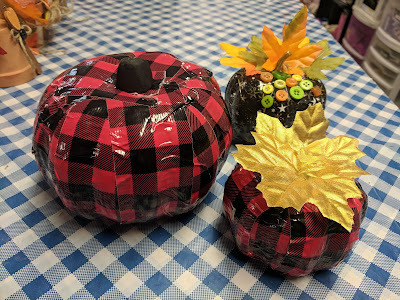 A few of us made these cute ducktape covered pumpkins. 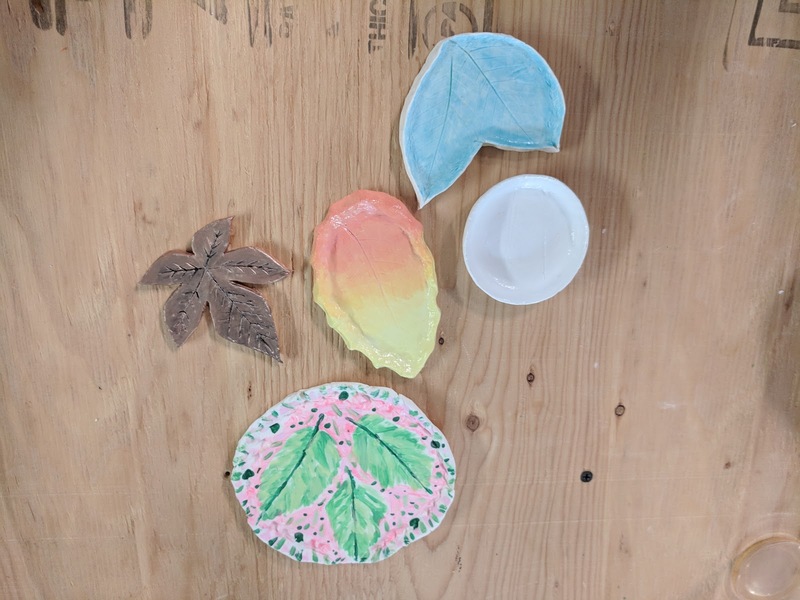 We made these clay dishes, inspiration here. They didn't turn out quite like the photo example but that's okay! I think they all turned out pretty and I don't really have a favorite. 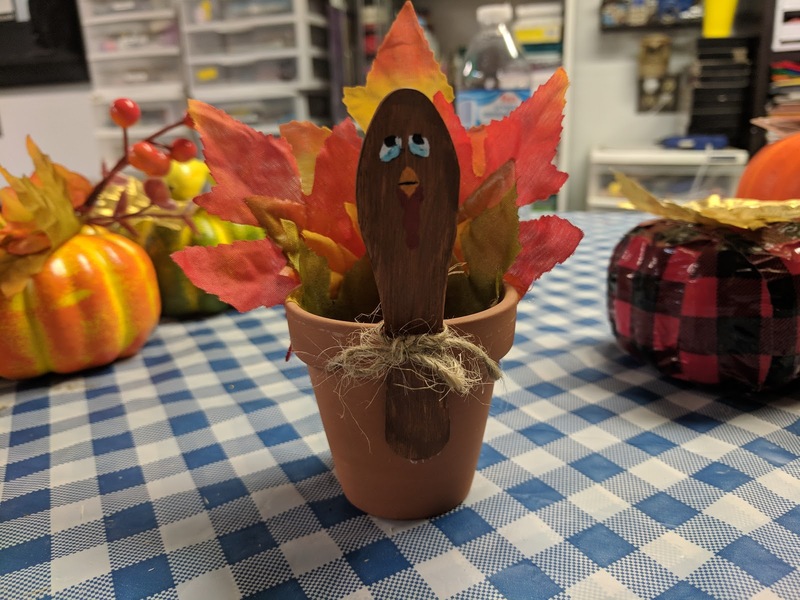 Inspiration here for these fun little turkey decorations! This would be fun to make for placeholders at your Thanksgiving dinner. I love how different these all turned out as well. 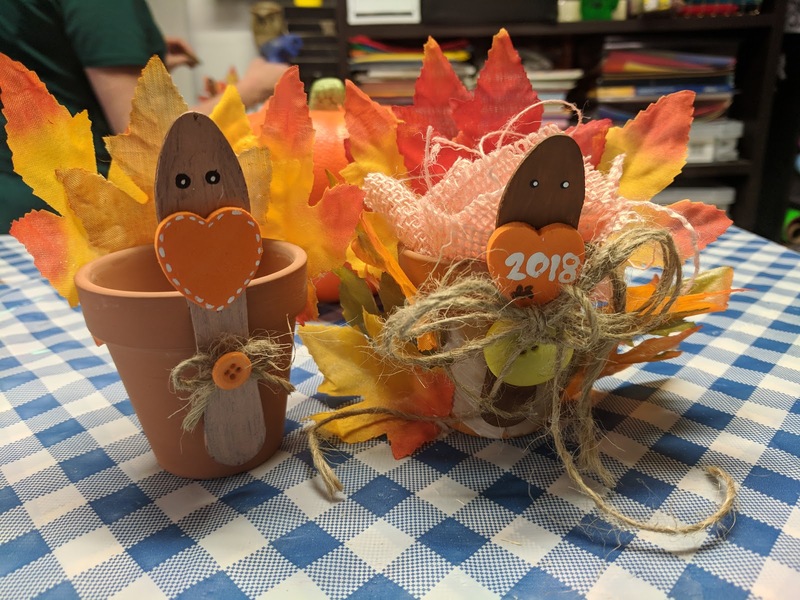 A small clay pot, those wooden ice cream sticks, wood hearts, leaves, paint and button and some twine...love how everyone's turned out so great. I think the hardest part were the eyes, lol. 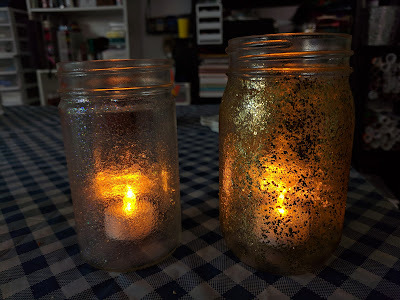 The final craft was these tealight decorative jars. The original idea was to mod podge leaves on the outside of the jars (I did that with mine - work in progress) but also this fun fine glitter and gold chunky glitter mod podge is super awesome! It doesn't flake off when it dries and Amy did a fantastic job making a couple of these night lights for her kids. So cute! 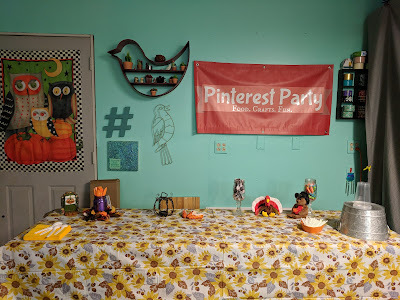 Next up - Christmas theme Pinterest party happening in November! A lot of fun! 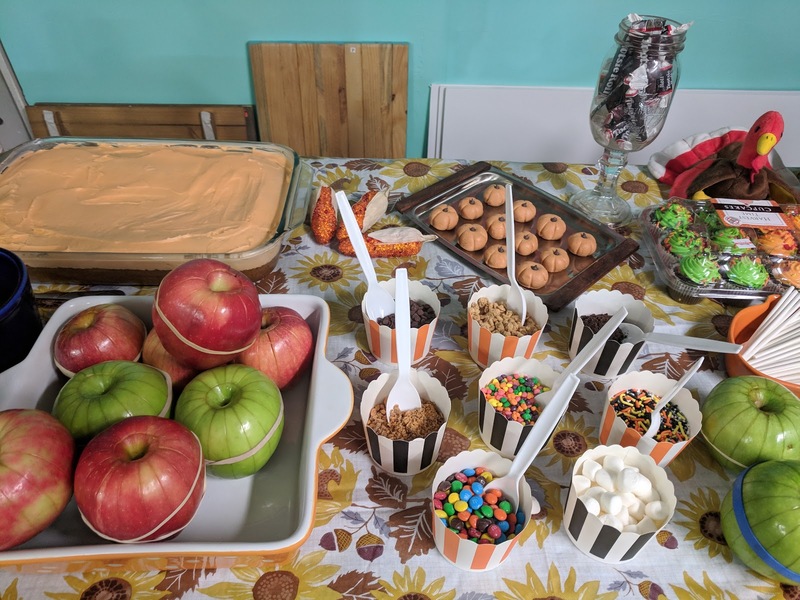 Tasty stuff too... thanks for hosting and loved the caramel apple bar!